I have a hard time with transitions. Going from elementary school to middle school was a nightmare for me. I was completely lost when I moved from Brooklyn to the suburbs seven years ago. And, perhaps just as dire as these First World predicaments, I can never figure out what works for dinner in late September/early October — when summer market VIPs are more like VMPs (M=Mediocre) and I’m not quite ready for the heaviness of, say, a beer-braised pork shoulder. This is when I am grateful for my Dinner Diary. I flipped back 11 years (above) to see how my 28-year-old self was dealing with the season switch. She was apparently much more energized than me (maybe because she wasn’t chasing kids around yet?) and had a couple good ideas: Chicken Pot Pies (a nice way to use summer produce that isn’t quite up to snuff anymore) Porcupine Meatballs, Grilled Pork with Apples (just replace apples for peaches in this link) and Black Bean Burritos (this link is a later, better recipe). Thanks 28-year-old Jenny! I knew I kept you around for a reason. PS: If you’re going shopping today, make sure you pick up the following: quinoa, onions, frozen spinach, eggs, whole wheat pasta, and a can of artichokes. I’m assuming you already have olive oil, soy sauce, and Parmesan. Even if you don’t check back in later this week to see how many different meals you can make with these ingredients, it doesn’t really matter. They are loyal pantry friends with long shelf lives — so they will be there for you when you need them the most. PPS: My friend Rory just sent me this story about happiness. Turns out a new study has determined that the happiest people eat home-cooked meals at least four times a week. (It also says that they drink alcohol four times a week, but it’s unclear if I reach debilitating levels of euphoria if I exceed that number.) Shall we all aspire to official happiness together? i really do think you get extra credit for more than 4x a week. Is 10:30 on sunday too early to start? Oh, that is why we have bloody marys. I am off to the store and will report back this shopping list. For me, I think the farmers market produce is only part of the september/october story. Our schedule is all new and I am having a hard time figuring out WHAT I want for dinner as I am running around with this new fall agenda. Nothing sounds good and i am so busy I dont want to make it. So tonight I am going to make beet, sweet potato, quinoa hash with eggs alla martha. Sounds warm and easy. Very fall…should fit right into the schedule. And I agree, my family around the dinner table each night is the most happy. Wow! You have some good eyes. Anniversary! Off to Degustation right now to celebrate!!!!! 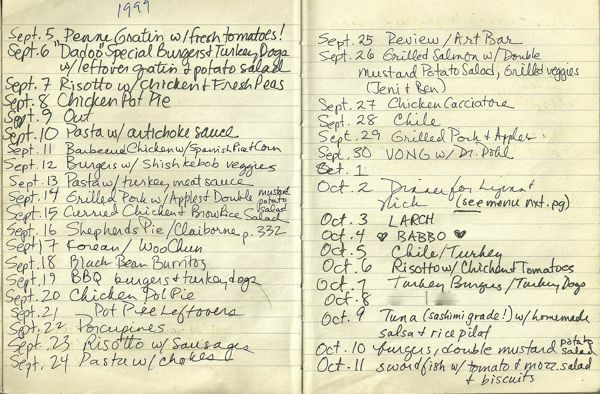 do you have one gigantic notebook with all your years of dinner-journaling, or do youhave lots of little ones, or do you combine the dinner lists with other topics in your notebooks, or how do you do it?